Bekijk gerelateerde producten mét startdata: ISO/ IEC 20000, Sun en Microsoft ISA, IIS & SMS. This five day course enables participants to develop the necessary expertise to audit a Service Management System against ISO/IEC 20000-1:2011 and to manage a team of auditors by applying widely recognized audit principles, procedures and techniques. During this training, the participants will acquire the necessary knowledge and skills to proficiently plan and perform internal and external audits in compliance with ISO 19011:2011, as well as understanding the certification process according to ISO/IEC 17021-1:2015. The course consists of a mix of presentation, discussion and exercises based on real-world examples. This course is designed by PECB in Canada, who also mark the exam and issue respective certifications as per their criteria. 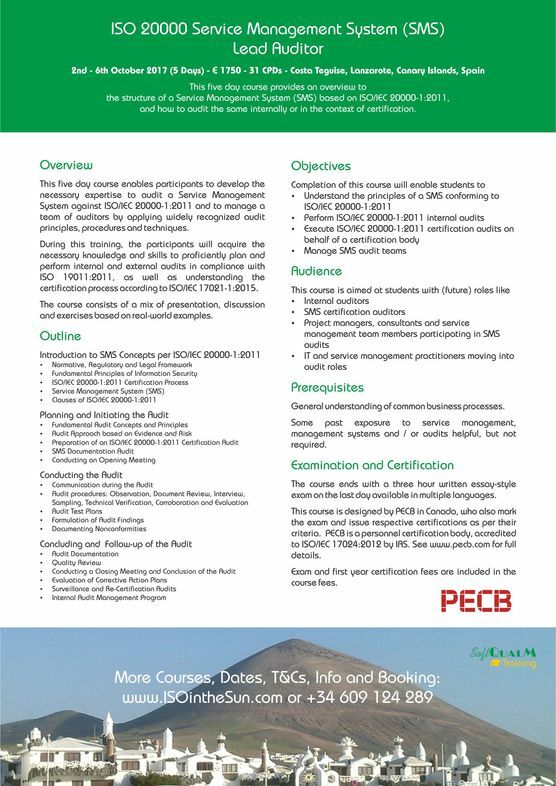 PECB is a personnel certification body, accredited to ISO/IEC 17024:2012 by IAS. The course consists of four days lecture, discussions and exercises in English, followed by a three hour written essay-style exam on the last day. For those less fluent in English, the exam can be written in a range of other language - please enquire for details. The course fee is €1750 and includes courseware, exam fees and Canarian-style lunches. NB: Under Canarian tax rules, fees are subject to 7% IGIC for clients based in the Canary Islands as well as for students attending in private, i.e. not being delegated and paid for by a company, regardless of their location. We will be more than happy to help source suitable flights and accommodation, whether you come just for the course or want to combine your visit with a break, whether on your own or with family. From own experience now living in Lanzarote we can assure you that flights to Lanzarote regularly are no more expensive than national flights yet you gain a unique learning environment. Courses are running from 1 or 2 students as well as being limited to a maximum of 10 students each, so book early to avoid disappointment. Ever thought of combining your continuing professional education with a holiday in the sun? Here is your opportunity. For more information please contact us at info@ISOintheSun.com and check out ISOintheSun.com. NB: We are scheduling more events all the time, so please get in touch if interested in other subjects and dates. Individual as well as Integrated Management Systems addressing Risk, Information Security, Business Continuity, (IT) Services and other areas are getting ever more important for ever more organisations. As conformity with the respective ISO standards increasingly becomes a requirement to do business, management and their staff wonder how to get there. ISO in the Sun is an ongoing series of courses on Risk, Information Security, Business Continuity, Service, Project and Integrated Management hosted by SoftQualM in the beautiful surroundings of Lanzarote in the Canary Islands, Spain. This is the ideal opportunity to combine your continuing professional education with a break in the sun, and even save compared to attending similar courses in the typical metropolitan settings. Students come from all kinds of industries and sizes of organisation, from freelance consultants and auditors to EU institutions. Bekijk gerelateerde producten mét ervaringen: ISO/ IEC 20000, Sun en Microsoft ISA, IIS & SMS.